This week I went out, to a thing, and I talked to people. The Festival of Maintenance was a one-day conference that was very nice and very varied. Having a conference focused on a theme that’s common to many different fields seems a great idea, because it means most of the talks will be from fields you know little about. Simon Elmer from Architects for Social Housing on refurbishing and expanding council housing estates rather than knocking them down and building something new. The anonymous Guerrilla Groundsman (pictured) on fixing and improving things around the streets of Cambridge. 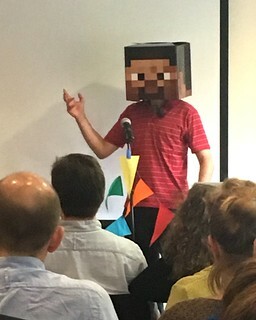 I assume he maintains anonymity by wearing his Minecraft mask when repairing street furniture, like a geeky altruistic Frank Sidebottom. Adrian McEwen on how the co-working makerspace DoES Liverpool keeps track of what maintenance and improvements need to be done, and how they got done. I liked the idea of a “Somebody should…” list of tasks. He also made a GitHub issues list for Liverpool. Chris Hellawell talking about Edinburgh Tool Library, who was so enthusiastic and cheery that I wanted to pop up to Edinburgh to borrow some tools. Well done everyone. It was also very nice to bump into a few people I hadn’t seen for years. Hello! Another movie this week, Lucky (2017), which I think was Harry Dean Stanton’s penultimate film. I liked it. It took me a little while to get into it as it felt a bit stilted in a way, like each little scene was a standalone vignette, and each speech within was a standalone soliloquy. But once I was on board it was good. Slow and thoughtful. It made me think about getting old and how I want to get there and where I went to be when I do. Obviously, I didn’t think about it hard enough to make any decisions. I’m enjoying the return of American football, even though in many ways the NFL is not A Good Thing. I am weak. I enjoy the sounds and the rhythms, and the chat on the BBC’s shows is fun. The past couple of weeks I’ve been doing a bit of work for a client, flattening several old microsites into self-contained sets of static files that will be simpler to host over the long term. It’s quite satisfying but is a process full of many little wrinkles and tricksy things. I think that’s about all. I hope you have a good week. Have a treat.